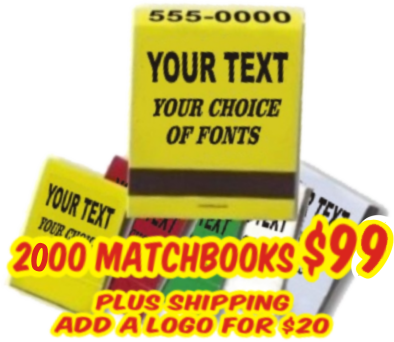 Personalized Service -- Many styles and colors -- Low prices -- Custom printed matchbooks delivered right to your door! Your choice of book and print colors. Printed with your business name, address, phone number, website, etc. 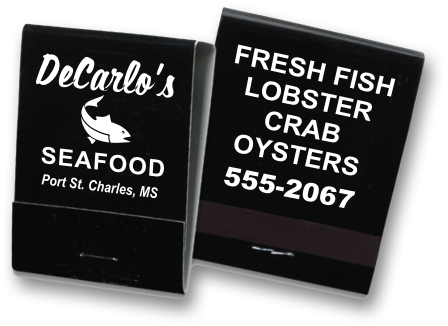 Advertise your restaurant, bar, club, or organization with custom printed matches and matchbooks. I offer all types of printed matchbooks and box matches from standard economy priced to premium 4-color and metallic foil quality at discount prices. Custom printed with your logo, address, phone number, location map, whatever you please! Your choice of colors and designs. I do all the artwork in-house and will design your custom printed matchbooks free of charge. You'll receive a proof by e-mail for your approval prior to printing. Your custom printed matches will be shipped right to your door via UPS. For excellent quality, quick service, and low prices on custom printed matchbooks, look no further! Please call 303-519-8968 or e-mail for complete details and pricing.